Blockchain technology and bitcoin are promising a lot. Promising the world in fact. You’ve all heard the rhetoric. However what you don’t hear as often is how this will all unfold and what the blockchain world of tomorrow will look like. In this article I will be so bold as to do just that. Now the following is a culmination of my newly found interest in everything blockchain paired with a long running fascination for philosophical questions, fueled by countless hours of high caliber documentaries, TEDtalks, and reading. So this is it, what you’re about to read is the one stop future state of the world. Now granted this may be my own Utopian vision and surely not everything or maybe nothing described here will work out how I envision it. However this can form the starting blocks for future thought. A frame in which to place all the crypto promise and craze of the last few years. At the center of it all will be preferably one, or maybe a handful of cryptocurrencies that will function solely as a store of value. At the time of writing Bitcoin seems to be undisputed champ in this regard. However the currency is not without fault, given that it is already in the hands of a few, referring to the fact that 40% of the worlds bitcoin is in the hands of the top 1000 bitcoin addresses. Secondly the advent of the centralization of mining power seems to be of significant concern for what was initially supposed to be a decentralized currency. Problems aside however having one central blockchain to which all/most others are pegged seems like a logical step at this time. A new and improved gold standard if you will without all the shortcomings. If this shall indeed be the case then blockchain interoperability will play a critical role in the blockchain ecosystem of tomorrow. As much as the crypto community might despise the word government anywhere near the decentralized utopia they envision I believe governments will still play a vital part in this space. The main one being that governments give out identities. Birth certificates, passports, driver’s licenses, all these forms of identification are provided to you by your government. A very easily underrated activity, however critical in the blockchain world of tomorrow. Why is that? Because that is the only relatively “tamper proof” system we have this day and age to discern one human being from another. Any other online form of identification can be manipulated/tampered with. That is why we today still have to rely on our analog identities in some way or form when we want to do anything significant online. This vital task will enable anyone to have their own blockchain identity. Only one per person, each and every modern person having one, granting access to all the services we as mankind hold dear. But more on that in a bit. Banks — A more controversial role for the government may be to influence the medium of exchange i.e. our money either through banks, as has been the case for many years and as Patrick Byrne so comically put in this debate; A man tinkering on the nobs and switches telling us how much something should be worth. Mocking the financial institutions tasked with monitoring the value of money and arbitrarily reacting or overreacting to changes in that valuation, inadvertently causing financial crises. Or, like a myriad of tasks in the future, financial institutions of tomorrow may leave that up to Artificial Intelligence. The latter having this authors preference. However this area is the most uncertain at this moment. Will each country have their own digital currency, monitored and controlled by central banks? Or will there be a handful of cryptocurrencies used as legal tender? Or even just one global currency that we will all use as cash and if so, who will be in charge of that? The problem with most of today’s cryptocurrencies is that they are already unfairly distributed at the time of creation. Bitcoin has 10% of the coins in the hands of Satoshi, the infamous creator of the coin. Bitcoin Cash (BCH) has about 27% of all coins in hands of the top 165 addresses. If we are to truly envision these as global currencies to be used by everyone, then starting with a small group of people owning a significant portion is not a good start. This would in effect make them the kings and queens of the world. What we need is a new currency evenly distributed to all. How this can be achieved is described below. Medium of exchange — Some may wonder why I placed medium of exchange or put into layman terms “money” under the branch of identity? That was purposefully done for the following reason; a universal basic income. For those who haven’t heard of the concept before a universal basic income is an income that you basically get for nothing. Or more eloquently said, an income that you have a right to irrespective of all other factors. The main idea behind it is that if you have a basic income and don’t have to worry about surviving, you can do that which you are truly interested in/passionate about, living a happier fuller life. Now I won’t go much more into detail here but you can watch more about it here. How do I envision this working? Pegged to your blockchain ID, you download or actually every phone sold comes with a basic income app pre-installed. All you need to do is identify that you are in fact one unique person and you automatically join the pool and get a basic income every month (only one per person, so having 100 phones does not give you an advantage). Potentially this app will be running in the background on every phone contributing a small portion of its computing power to maintain the blockchain, however that is not an essential aspect (although with roughly 5 billion phone users in existence that could add up to some significant power). So much for the how. How about the why? Daniel Jeffries explains in this article the power of wealth distribution at the time of creation. This concept will be the fairest system for all the worlds’ inhabitants to join in on the economic development and partake in the global economy. I personally find no man, woman, or child should go hungry in this world of abundance we live in today. Not only that, but the current system is not sustainable. Debt is rising through the roof, the divide between the rich and poor is growing larger, and with the advent of technological advancements, jobs, especially low-skilled ones, but soon also medium to high skilled jobs will be done better by robots. Leaving countless people jobless and wishing they had some form of safety net to fall back on as a result. Not only that, but a basic income will enable us to rewrite the parameters of what it means to be a human being. Because work is so deeply ingrained into our society or into the proverbial system, it has become, or better said, it has always been synonymous for who we are; “I am a taxi cab driver”, “I am an IT-consultant”, I am, my work. However, (and I am well aware that this may come across as philosophical mumbo jumbo) blockchain technology can potentially liberate us from being our work, to being human beings that are so much more. Wages — A basic income may be considered a socialistic approach. Some critics will argue that people will become lazy and not work, and although this may be true for a select few, studies have shown that human beings need to have a sense of purpose and that’s where work comes in. The only difference will be the type of work they chose to do, pursuing work they are intrinsically motivated to do, or bettering the conditions they are willing to work under. Sale of services and goods — The concept of capitalism will not fade. Those who want more for themselves can continue to work, or sell a product or service. In fact their customer base will only be larger thanks to inclusion of many previously impoverished people unable to partake due to their limited or non-existing financial resources joining in on the economic playing field. Blockchain technology will also have a profound effect on the health industry. It is very imaginable that in the near future we will all have digital medical records stored on a blockchain. Having the ability to grant access to hospitals, insurers, or any other medical practitioners that require that information. Catering the information requirements to each of the requesters, so that only the necessary information is shared. Now how this will exactly pan out is not clear to me, I am by no means an expert on the health industry, however some form of general template (hospital, doctor, insurer) is likely. Having this information readily available (via an app, or system at the medical institution) can enable life saving measures across all borders as there will be no delay. Aside from that, metadata or anonymized data can be aggregated and used for medical research on a scale that is unthinkable today. Leading to life saving medicines and procedures. This term is gaining momentum within the crypto community however I believe it is not yet widely known. What is meant with the tokenization of assets is that things such as art or real-estate may be soon tokenized, as in; owning tokens will entail owning a part of, or the full asset. With the advent of tokenization of assets it will be as easy to own a piece of art or real-estate as it is to buy a crypto coin online. Enabling a wide diversification of one’s portfolio. Not only that but it is imaginable that thanks to blockchain interoperability, a dashboard can be built to get a complete overview of ones total net worth. Just picture a user friendly dashboard that has an overview of all your cryptocurrency holdings, tokenized assets, 401k or whatever retirement plan you use, and potentially even expenditures. With features such as tracking net worth, expected returns, and future net value. Giving us insights and control over our finances that would be considered close to impossible or very cumbersome to achieve today. Local — Local issues and governing parties. Federal — Country wide issues. Not only pertaining directly to political parties, but it can even be the case that parties present spending plans and that the nation gets to decide whichever plan they want to go for. International — Picture having the right to voice your opinion on G20 discussion topics, or on the course of action of the World Bank, or the IMF. Potentially pipe-dreams now, however there may come a time in the future when future generations look back and it be unimaginable to not have those rights. As with the health industry, blockchain technology can be used to track and verify the historical accomplishments of users at all types of educational institutes, from university and college degrees, to certificates that can then either be standardized or simply globally recognized. 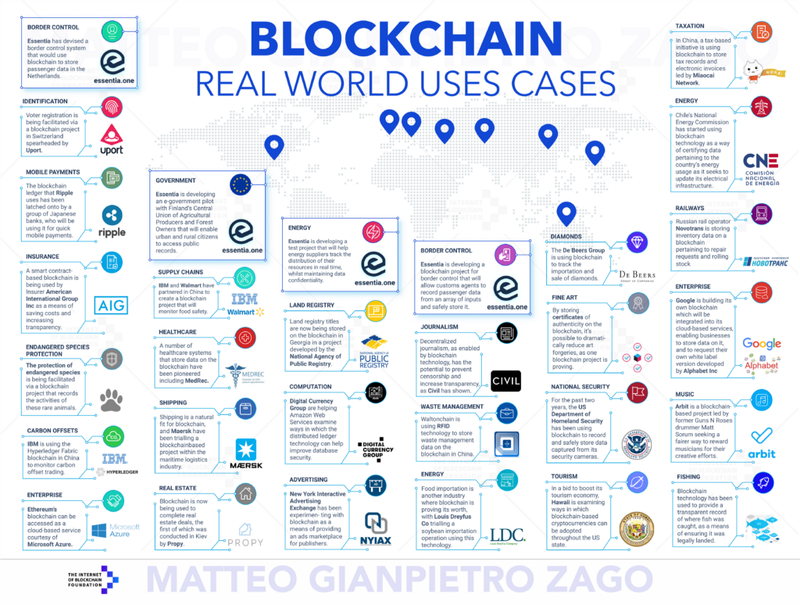 In order for most if not all these blockchain applications to work there is one central factor required and that is being able to identify and distinguish whether you are the individual that you say you are, and that is where I believe governments will play a key role; some form of regulations (the judicial parameters of who can access your information and under what circumstances) and the identification of individual persons. As you may have noticed if you’ve made it this far, is that I haven’t mentioned many names of actual tokens or currencies that are currently fulfilling or promising to fulfill the different applications outlined. The reason for this being that it’s really anyone’s guess, and I find that would subtract from the overall message behind this article, namely, that the genie is out of the lamp. Blockchain technology can, and most likely will have profound applications, probably even beyond that which was addressed in this article. Being aware of, and more importantly open to those applications will put you ahead of the game. Hope you enjoyed reading. Would love to hear your thoughts on the matter whether it’s in the comments or via a direct message. Future State — How blockchain technology will change our lives forever was originally published in Data Driven Investor on Medium, where people are continuing the conversation by highlighting and responding to this story.